Our guide Kevin is a SF native. He cheerfully and confidently led us up and down hills and stairways through many charming residential neighborhoods and parks. Beautiful views of the city, great 3-hour moderate workout, and lots of surprises, even for our son and daughter-in-law who are residents. Starting and ending in Castro was convenient, and great dining and coffee opportunities after the hike. Definitely recommend! Had a fantastic tour with Val , he was very Knowledgeable and friendly guy. We would highly recommended this tour . It was a marvelous experience. Seeing San Francisco from a very different viewpoint or better points. Our guide was excellent, very accommodating. Only do the hike if you are in decent shape. It is a hike lots of step stairs and hilly areas, but well worth it. Fabulous tour and guide. Alex designed a very interesting route and Val executed it with so much information and charm. We got to see hidden neighborhoods, climb multiple stair passages, wander in eucalyptus forests and have amazing vistas. Highly recommended. My family and I were lucky to have Dani, such a lovely and friendly tour guide! 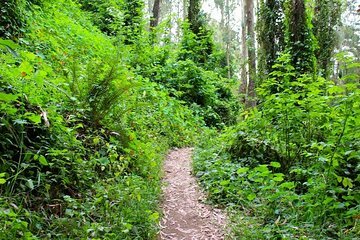 I would recommend this hike to anyone visiting SF. It is the best way to see the city's culture, history, unique hills, neighborhoods, and changing weather temps. Wearing comfortable sneakers or hiking shoes is definitely rrecommended, since you'll be taking on steep sidewalks and wooded areas. Also, dress in layers. One minute it's warm and sunny, the next like on top of Twin Peaks, it is very windy, misty, and cool. Our way back from Sutro Tower was was muddy and slippery at times, so be prepared in case that happens. Dani is a delightful conversationalist, and knowledgeable in the history of the city. She even had snacks for us when we reached the top of Twin Peaks. This is a very energetic, interesting, and breathtaking tour. Hills and Hidden Gems, indeed!! This tour was great! Alex, was amazing full of fun facts and an amazing passion for the city. She is very welcoming, informative and greatly prepared. I really enjoyed how she felt out the pace of the group and allowed us time to catch our breath when ascending each staircase or high hills. She was prepared with snacks for the midway of the hike. The hike itself was well planned with plenty of historical and scenic views and very worth every penny! Hiked to top of Twin Peaks. We felt like we were hiking in the forest- hard to believe we were in San Francisco.